People sit in a boat after being evacuated from their flooded houses in the town of Obrenovac, east from Belgrade May 16, 2014. 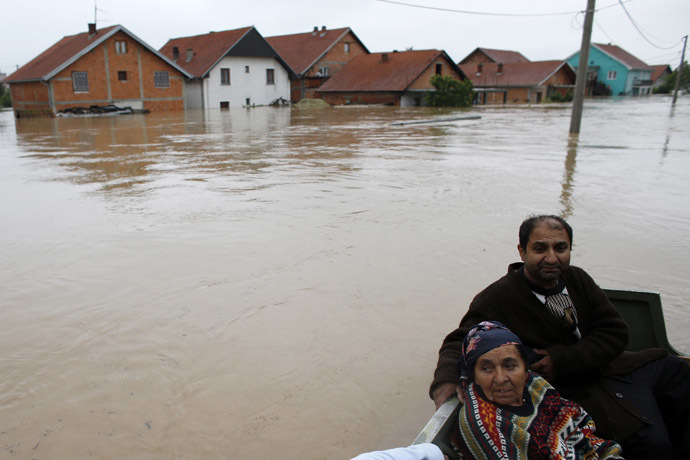 (Reuters/Marko Djurica) More than 20 people have been killed in what has been branded the worst flooding on record across the Balkans. Tens of thousands have been evacuated and 250,000 homes are without power. The death toll has reached 19 in Bosnia alone, including nine people found on Saturday when waters receded from the northeastern town of Doboj, Reuters reported. Authorities have warned that more bodies could emerge as waters recede in dozens of cities flooded over the past three days. Serbia has seen eight deaths, AP reported. "This is the greatest flooding disaster ever. Not just in the past 100 years; this has never happened in Serbia's history," Serbia's Prime Minister Aleksandar Vucic told a news conference on Thursday. "More rain fell in one day than in four months," he added. On Friday, about 135,000 households were left without power across Serbia, and the government approved emergency electricity imports. Another 65,000 were without electricity in Bosnia, Reuters reported. "This is a catastrophe. Nature has never been so cruel to us," Serbian Energy Minister Aleksandar Antic said. On Thursday, the Serbian government declared a state of emergency across the country, and asked for international help. One of the most difficult situations was in Obrenovac, one of the suburbs of the capital, Belgrade, which was submerged almost completely due to the river Kolubara overflowing. The evacuation is continuing in the area. Thousands of people are escaping the flooding over the rooftops. Russian rescuers working at the site have evacuated over 500 people so far. The situation in Obrenovac is “rather difficult,” chief military expert for Russia's Emergencies Ministry, Eduard Chizhikov, told Interfax. “The water level remains high. People climb on the roofs to save their lives. We're in close contact with Serbian servicemen, policemen, and rescue services,” Chizhikov said on Saturday. He added that rescuers managed to save the lives of several people when their boats overturned. The team of 76 rescuers arrived in Serbia on Friday at the request of the Serbian government. More rescuers are expected to be sent to the area soon. Serbian emergency services workers evacuate people from floodwaters in the town of Obrenovac, 40 kilometers west of Belgrade, on May 16, 2014. (AFP Photo/Andrej Isakovic) A Reuters photographer in Obrenovac estimated the water level at 2-3 meters. "The whole town is under water," he said. Obrenovac is where the “Nikola Tesla” thermal power station is situated, and its failure could lead to massive power outages throughout the country. Shops in Belgrade are experiencing shortages of bottled drinking water in the wake of the flooding all over the country, RIA Novosti news agency reported. The Serbian government has addressed the civilian population, asking for help in protecting the state from the flooding, the country’s premier Aleksandar Vucic said on Friday. The situation in the country is much harder than anyone could imagine, he stressed. Vucic asked for 1,500 volunteers to protect the town of Sabac, 100 kilometers to the West of Belgrade, because the police and the army have no more human resources to offer. “Tens of thousands of homes could be affected, and the damage could be biblical. I can’t even speak about human lives here,” the premier said. This used to be a stadium. Please RT Bosnia and Serbia need help,lives are in danger!! 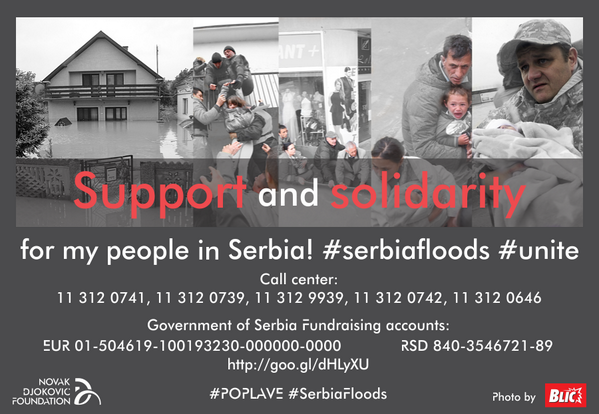 #PrayForBosnia#PrayForSerbiapic.twitter.com/Pc6hVqqiLs — smash please ♡ (@edwardxirwin) May 16, 2014 The Serbian government also requested the population donate boats to the authorities, and asked hotel owners to provide accommodation for rescue workers. Overnight, thousands joined army forces, police, and firefighters to build sandbag flood defenses around the town of Sabac. The flooding, triggered by torrential rains that began on Wednesday and the overflow of rivers, has led to the flooding of hundreds of communities, thousands of residential buildings, and 10,000 hectares of agricultural land in Serbia. In some areas, rescuers can only reach locals using boats and helicopters. Authorities in Bosnia have said they were evacuating 10,000 people from the eastern area of Bijeljina and accommodating them in schools. Another 1,000 people, including babies, pregnant women, and the disabled and elderly were evacuated from the Zeljezno Polje region of central Bosnia, after hundreds of houses had been destroyed in landslides. "I think we'll never be able to return to our village," local Muslim imam, Zuhdija Ridzal, told Reuters. "It has disappeared in landslides." The northern Bosnian towns of Samac and Modrica evacuated people with trucks and bulldozers, which also carried food to the most affected.